Karen Carpenter and her brother Richard together as the Carpenters clearly demonstrate the emotions of an undefined Solar Plexus. Neither of the 2 have a defined Solar Plexus the center tied directly to emotions. This is why although many of their songs were about being in love or “saying “Goodbye to Love”, they could put that out their with the same tone, intensity and a smile on their face. It is almost as if the emotion is intellectualized in their songs. Whether they sing “Top of the World” or “Rainy days and Mondays”, while the words have emotional impact, and the instruments convey the mood, the emotions underlying their vocal expressions are almost neutral and not nearly conveying the joy or despair of the lyrics. Now contrast that with the pained expression by the band Nazareth in their sing “Love Hurts”. The undefined Solar Plexus can empathize and experience the swings in emotions from sadness to despair and every flavor in between. This is what helped Karen and Richard write so many songs about Love and hardship but they couldn’t live and express that on stage consistently at the true level of those emotions. 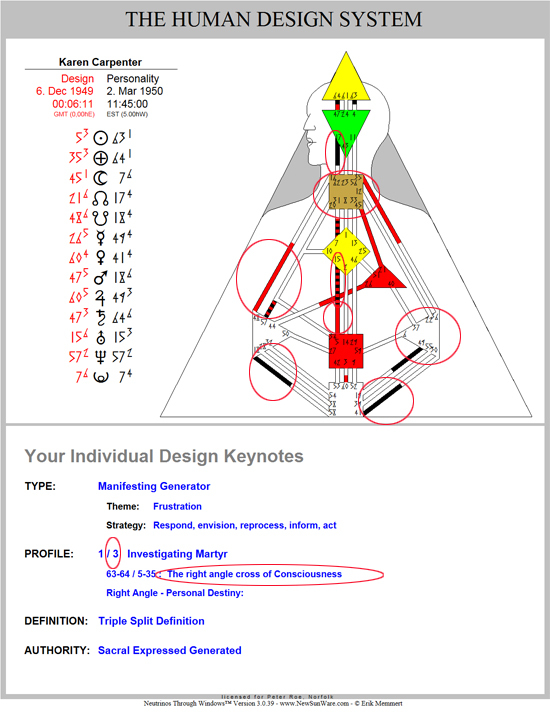 Below is Karens chart and if you hover over the red circled areas you will learn more about her design and how it manifeted in her lifetime.